Do you have plans for Sunday, February 24, 2013 yet? Boy have we got the deal for you! If you're located anywhere in the greater Puget Sound region, the Seattle Wine and Food Experience presented by Snoqualmie Casino is the place to be. 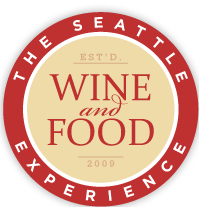 Founded in 2009 the SWFE "is the premier showcase for wine and food in the Northwest. Experience a world tour of wine, beer, spirits, and all things culinary." Seattle is host to a number of wine, beer, and spirits events over the course of the year, but there are two things that make the SWFE unique in our book: the food and drink selection, and, the charitable mission behind the event. While I'm about as big of a fan of Washington wine as they come, sometimes it's nice to branch out a bit and that's exactly what SWFE allows you to do. Unlike many festivals, SWFE has the full complement of Washington wine, plus an impressive selection of Oregon, Idaho, California, and international wines. Add to that a nice array of beer, cider, and spirits, from throughout the Pacific Northwest, and you've got yourself a party. More interested in the food part of the experience? They've got you covered there as well. SFWE features over 25 "eats" from some of the biggest names in the region. I'm already drooling reading about the Guinness pot de creme with whiskey whipped cream and chocolate pops that Macrina Bakery & Cafe will be serving. The Giving Grapes Foundation is a 501c3 organization that assists local charities who provide financial assistance to service industry professionals who have to take time off work due to injury or illness. In 2013, The Giving Grapes Foundation has selected Big Table as it’s non-profit of choice. 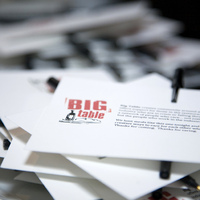 Big Table exists to transform the lives of those working in the restaurant and hospitality industry by building relationships around shared meals and caring for those who are in crisis, transition, or falling through the cracks. This community and care are open to all in the industry without condition. So, there's really no reason to *not* go to SWFE, and in fact, I can think of hundreds of reasons why you should. Tickets are available at Brown Paper Tickets for $55.00; we'll see you there!